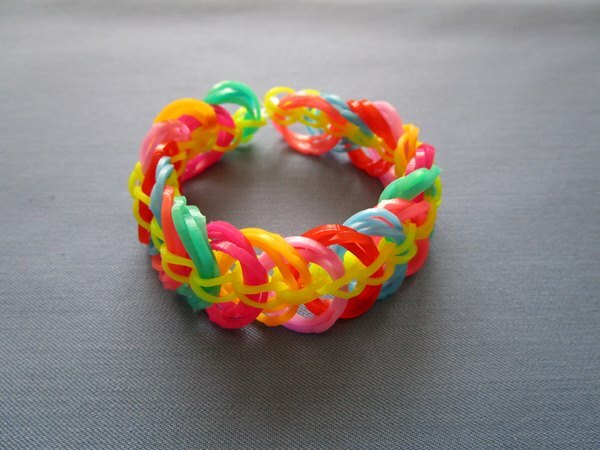 At today's lesson we will spin bracelets from elastic bands of popular patterns: "Scales of a dragon" and "A fish tail". 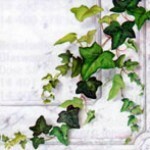 They are presented as in the classical options, and unusual, original. 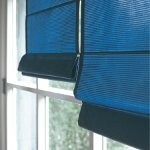 Also we offer you one master class in production of a brasletik with a rare pattern which we called "Friends". 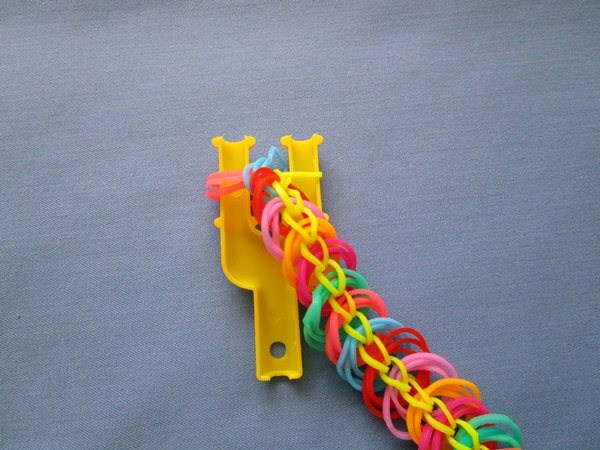 All jewelry trudges on different adaptations: machine, fork, slingshot and fingers. So, attentively watch our videos and a photo. 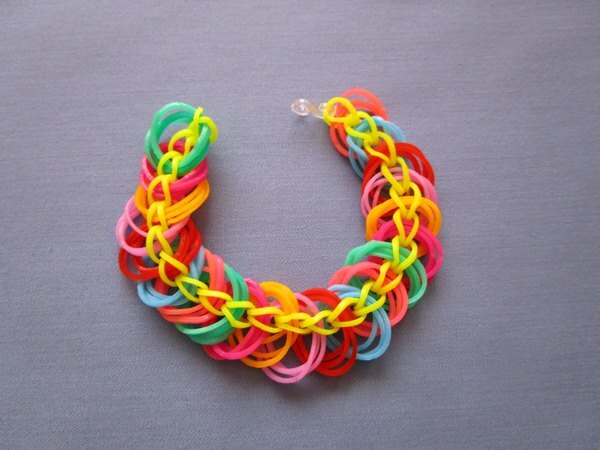 This bright, multi-colored and unusual bracelet looks very beautifully and fashionably. It perfectly will be suitable for a gift to dear friends. So, we will start. 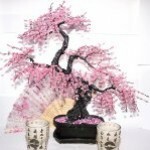 You can choose elastics of those flowers which you have. The main thing that there were 8 different flowers. 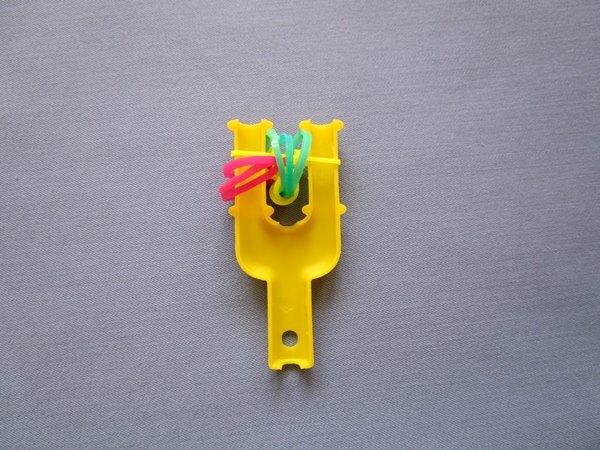 Throw a slingshot with an elastic of yellow color by an eight method. 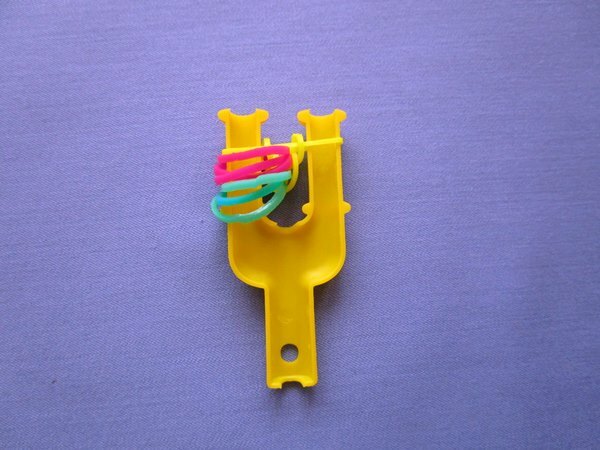 Throw with three elastics of green color the left side of a slingshot. Again throw with a yellow elastic, a usual way only now. 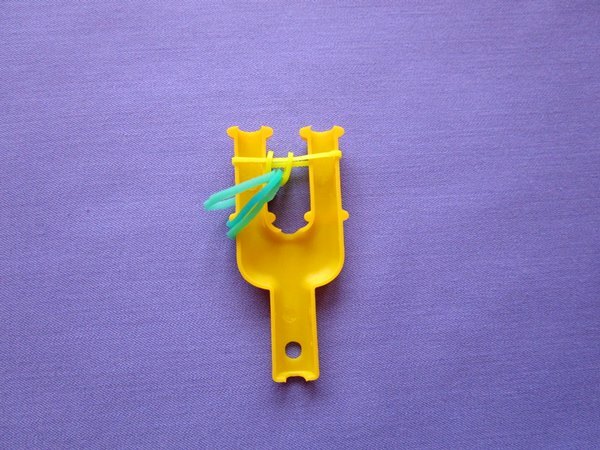 Hook hook on the first yellow elastic band on the left side of a slingshot and throw off it between columns. 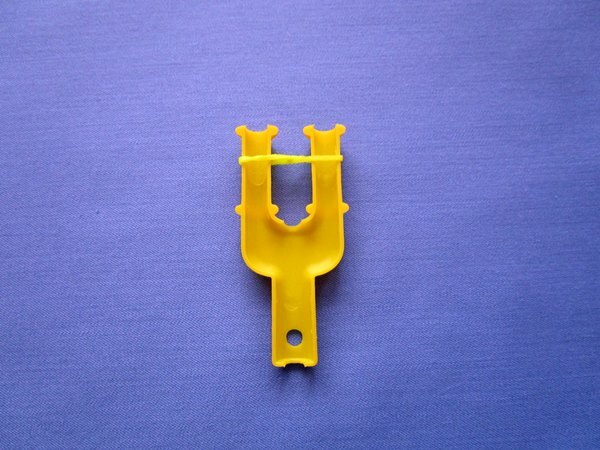 Make the same on the right side of a slingshot. Further throw with three crimson elastics the left side of a slingshot. 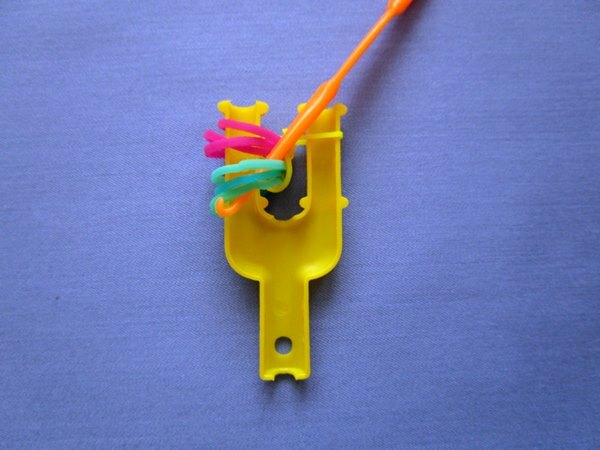 Throw with a yellow elastic (a usual way) a slingshot and take a hook the lower yellow elastic band on the left column. 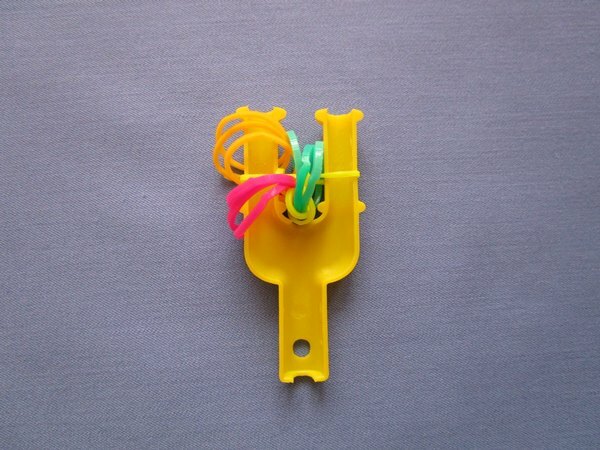 Throw off the elastic band taken by a hook in the center of a slingshot. Make the same on the right column. 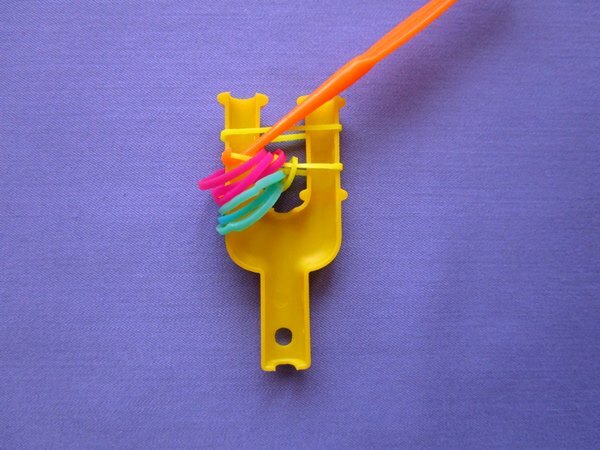 Now take a hook three green elastics and throw off them in the center of a slingshot. 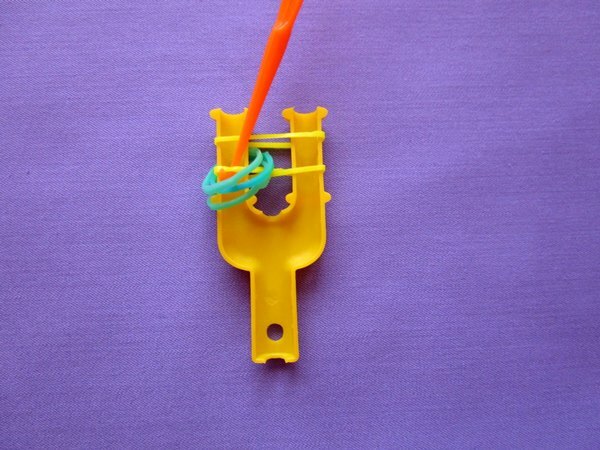 Throw with three orange elastic bands the left side of a slingshot. 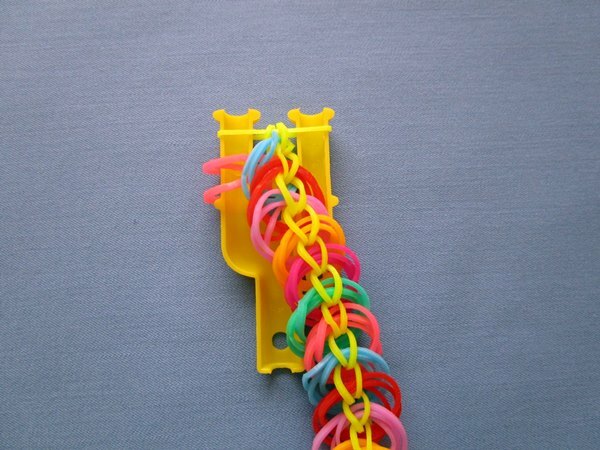 Continue weaving, repeating actions with 3 on 10 stage until at you the bracelet of necessary length does not turn out. 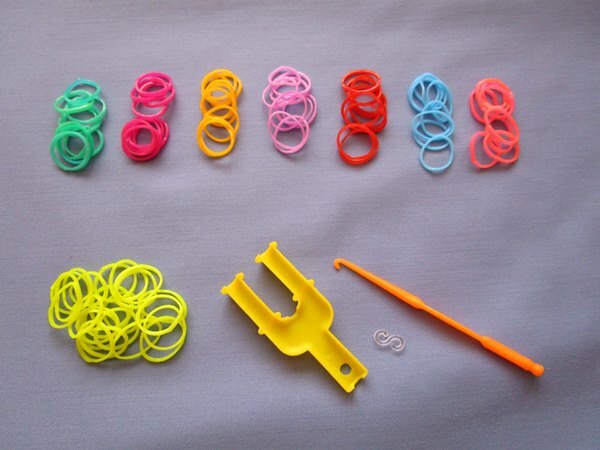 Use on 3 elastics of every color serially. I.e. the general sequence of flowers in our case will be such: green, crimson, orange, violet, red, blue, pink. 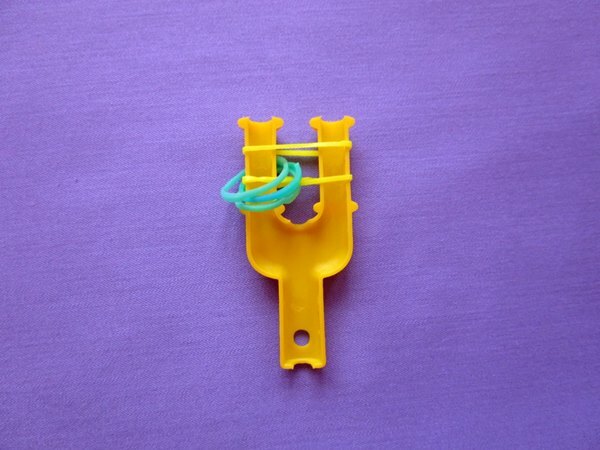 In completion of work you will have on a slingshot one elastic band of yellow color and three pink elastics on the left side. 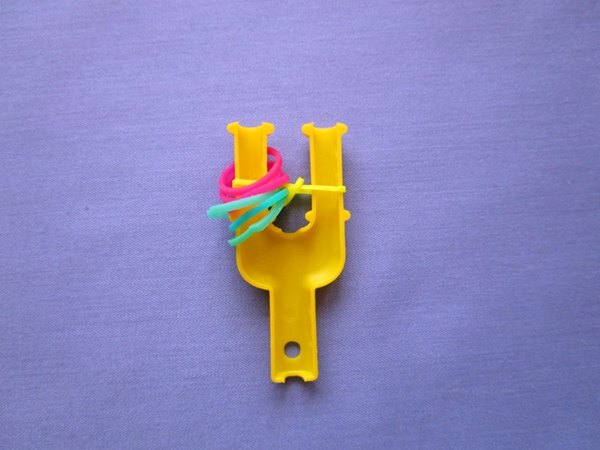 Throw with one yellow elastic a slingshot and take a hook the lower yellow elastic band at first with left, and then on the right side, having thrown off them in the center of a slingshot. 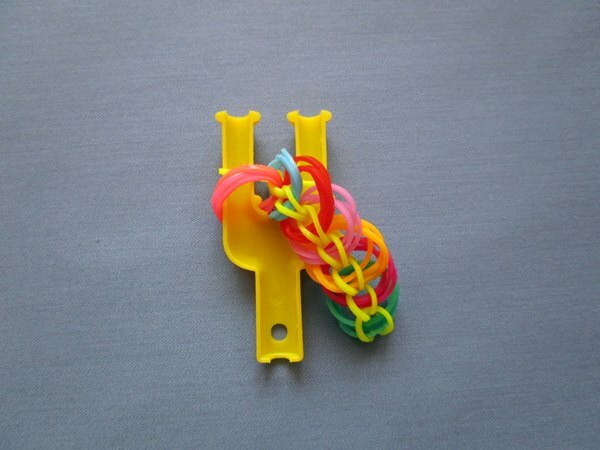 Now throw off three pink elastics in the center. 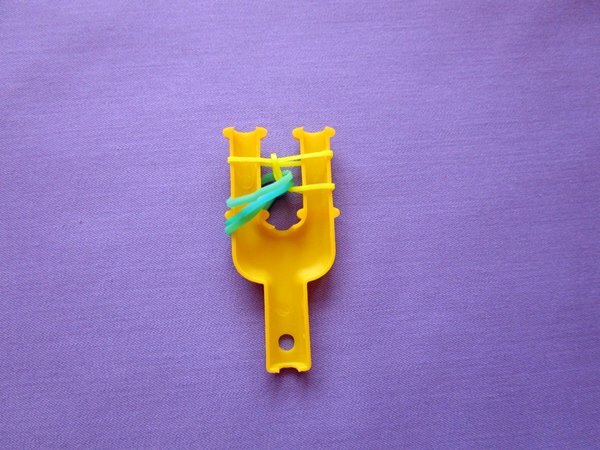 Take a yellow elastic from the right column and throw off it on the left. 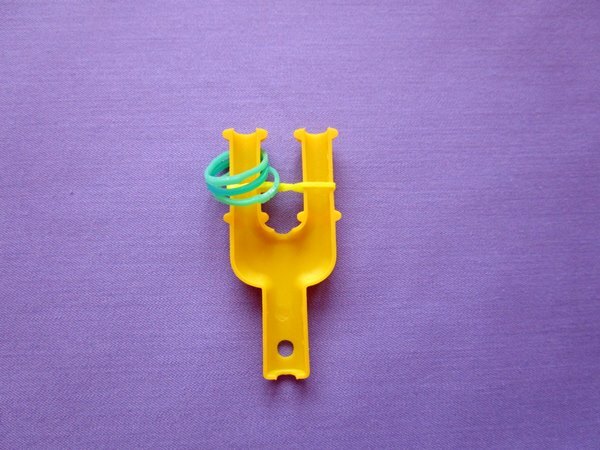 Hook on both elastics a clip and remove a bracelet from a slingshot. 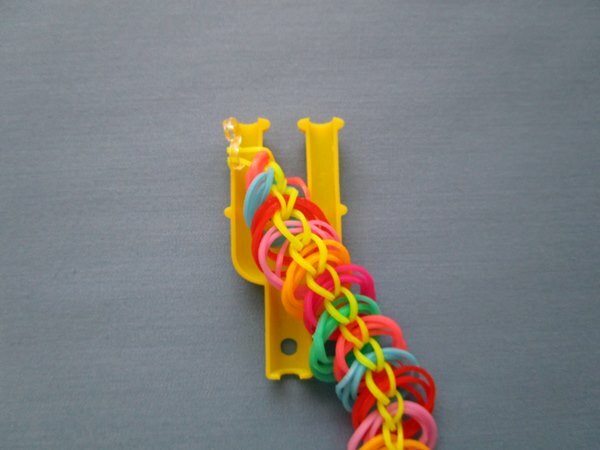 The bracelet "Friends" is ready! 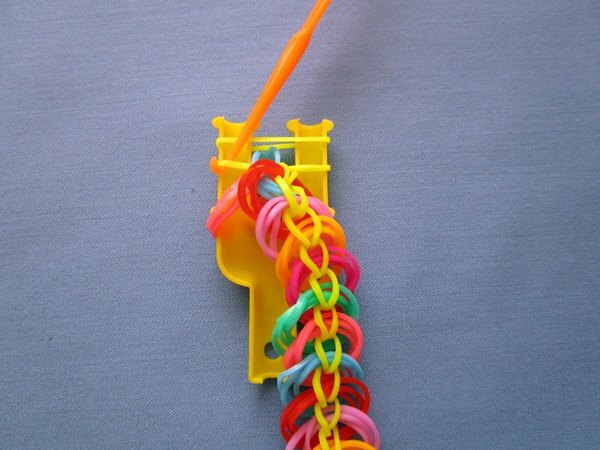 How to spin a bracelet from elastic bands "A fish tail"
How to weave bracelets with unusual beautiful patterns, read here.